How do people measure if they are receiving a good return on their real estate investment portfolios? What is the best way to evaluate the potential returns when comparing a number of deals? Return on investment (ROI) is a term of measurement utilized to provide an estimation or comparison as well as an evaluation on an investment’s performance. It is imperative to understand this accounting term as well as the basic formula needed for real estate investors. The calculation of ROI shows the percentage of invested money that will return to the investor following the deduction of costs. The investment's net profit is divided by the overall amount of the investment, and the results are to be expressed as a percentage. The overall cost of the investment does not only include the purchasing of the real estate asset. The ROI calculation will vary when there are the options of paying cash up front or taking a mortgage. In the case of taking a mortgage, there is the interest on the mortgage payments, which needs to be addressed within the ROI calculation. Furthermore, taxes and insurance must be accounted for, in addition to property management fees, renovation costs and maintenance expenses. Tenant vacancy is a major aspect which cannot be overlooked as it will affect the investment's monthly cash flow. There are also costs relating to the actual acquisition and exiting of the investment, which include agent fees, legal fees, costs of advertising the property, increases in utility rates over time, and the possibility that the asset may not sell at market price. In addition, the Total Return on Investment, or TROI, calculation provides the bottom line for investor calculations as it takes into account the post-tax cash flow rather than the pre-tax cash flow. On the iintoo platform, we make the process hassle-free by taking care of all of the aforementioned maintenance, property management, legal and agency fees for no additional cost beyond the minimum starting investment of $25,000. 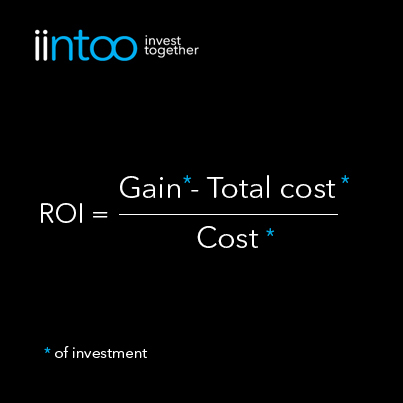 The out-of-pocket ROI calculation does not take into account the variables relating to purchasing fees and the property development (maintenance and renovations), unlike the cost-ROI method utilized by iintoo. For us, it is important to utilize cost as a preferred calculation to provide our investors with a closer indication of the real ROI. Cash-on-Cash is an excellent initial tool for evaluating and comparing property investments. The investor's cash-on-cash measurement is based upon the cash income (pre-tax) earned divided by the cash invested, and it is displayed as a percentage. Despite the fact that this is a commonly utilized tool, the ROI formula is far more comprehensive and utilizes a lot more variables in the equation. The ROI equation takes into account how much has been invested overall in the real estate asset as opposed to how much was actually paid for it. It is imperative to be consistent time and time again by utilizing the same methodology when inputting the variables in your ROI calculation across all of your deals – no matter which form of the calculation you choose to use. The aim of the comparison is to make it clear to you as the investor which deals are the most lucrative for you to invest in.